The season of swell is definitely upon us. Tofino surf for the past month has been great for north and south island. With these types of swell come long wrapping waves that seem like they will last forever. 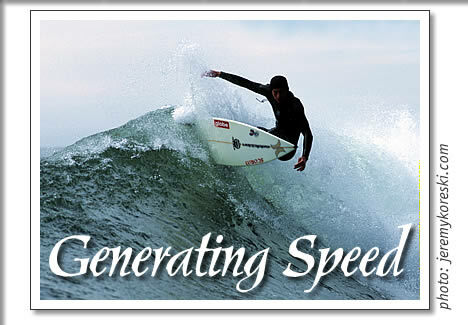 Generating speed is going to make these waves you catch even better. As the beginner surfer knows, trying to generate speed or pump down the line is difficult to get the hang of; think of yourself as being light at the top of the wave and then pushing down with your front foot, making yourself heavy again. When you are halfway down the face of the wave, transfer a wee bit of weight to your back foot and push off the back of your board. You will then travel back up the top of the wave making yourself light again. When you reach the top again, push down with your front foot and repeat this procedure down the line. Remember to stay high on the wave and not drop right to the bottom of the wave each time. The more speed you can create, the easier maneuvers such as off the lips and floaters will become. Don't get frustrated – this will take some time to get the hang of. Easier said than done, but I think when it comes down to it even trying to explain to someone how to do something on the face of a wave is a difficult task! The other important aspect of surfing is the bottom turn. Some say, it is one of the most important maneuvers in surfing: To generate speed and shoot yourself to the top of the wave and pull off a solid maneuver. A bottom turn is usually performed in larger surf, shoulder high and up; when you get to your feet dropping into a wave you generate speed rushing down the face of it. A good bottom turn will transfer that momentum back up to the top of the wave where in turn you are able to get a powerful snap off the top of whatever other maneuver you are going to want to learn. Bottom turns will easily set you up for most maneuvers in surfing. Unlike pumping or racing down the line, when performing a bottom turn you want to use the whole wave top to bottom. Drop in on an angle and slide down the face of the wave. When you reach the bottom, your knees are bent and shoulders turned into the wave or in the direction you would like to travel and you are looking at the top of the wave over your shoulder. Apply some pressure to your back foot and board and start turning off the bottom of the wave – you are now on your way to the top of the wave where you can smack the lip. I hope this will help some of you out the in the months ahead and remember, no one said it was easy. Jayson Bowers runs the Pacific Surf School in Tofino. Tofino surf article on generating speed by Tofino surf instructor Jay Bowers for Tofino Time Magazine.